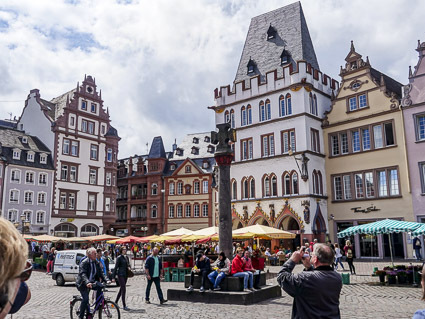 Trier is said to be Germany's oldest city. 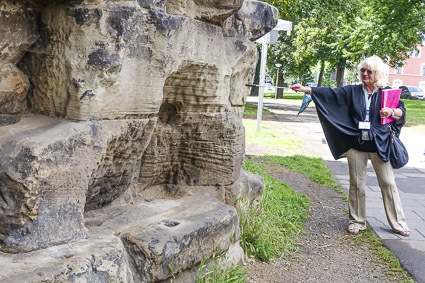 It's famous for its Roman ruins, which range from ancient baths to a 25,000-seat amphitheatre. 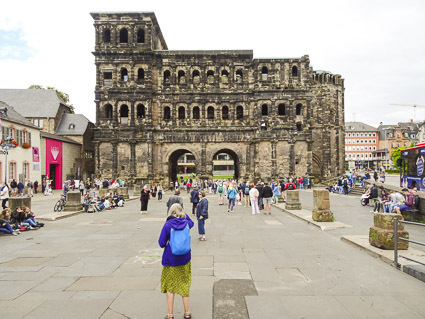 Our walking tour began at the Porta Nigra (built around 180 AD), the only surviving gate from the Roman era. 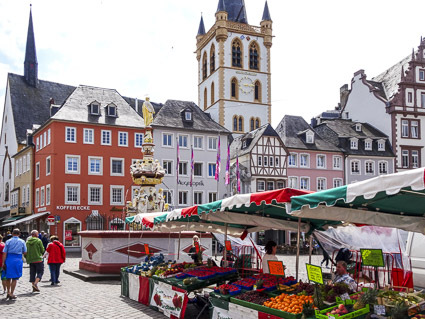 It's located at one end of the city's pedestrian shopping district, shown in the upper photo. 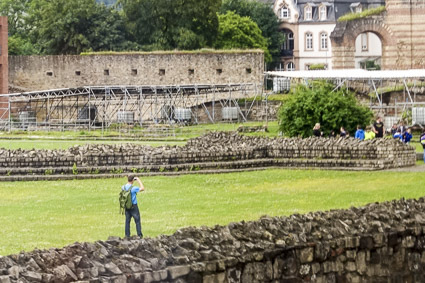 Our guide explained that the Porta Nigra was assembled without mortar. 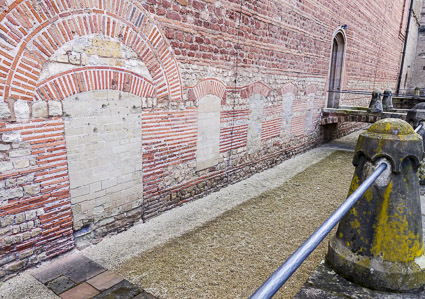 Instead, the huge stone blocks were held together with iron clamps. 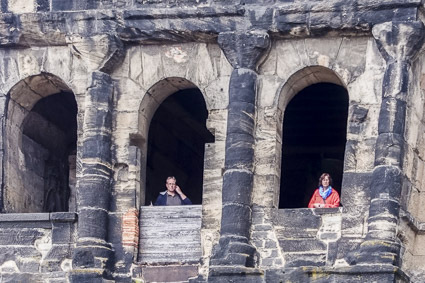 The upper floors of the Porta Nigra are open to tourists, but we didn't have time go explore the gate in detail. 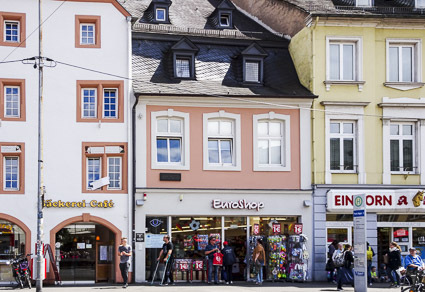 Trier's other claim to fame is the Karl Marx House (above the capitalistic EuroShop in the photo), where the socialist thinker, writer, and revolutionary was born in 1818. The house is now a museum. According to a Wikipedia article, it attracts about 32,000 visitors a year, a third of whom are from China. 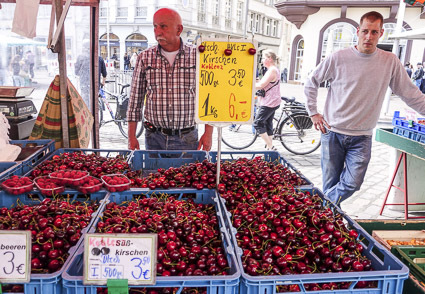 From the Karl Marx House, we walked through the pedestrian zone to the Hauptmarkt, or Main Market, where cherries were in season. 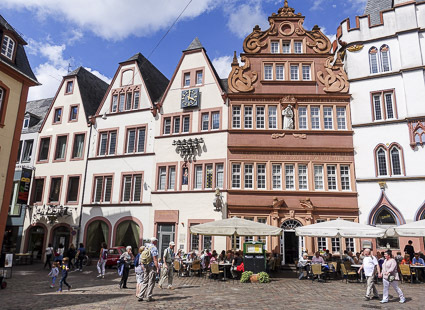 The Hauptmarkt is said to be "one of the most magnificent ensembles of histric houses in Germany." 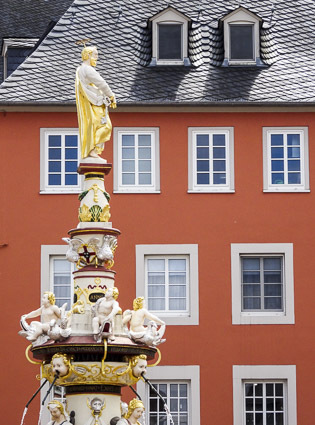 Two of the market square's signature features are the Rotes Haus (Red House) and a Renaissance fountain that shows St. Peter, the city's patron saint, "surrounded by the four cardinal virtues of good city government: Justice, Strength, Temperance, and Wisdom." 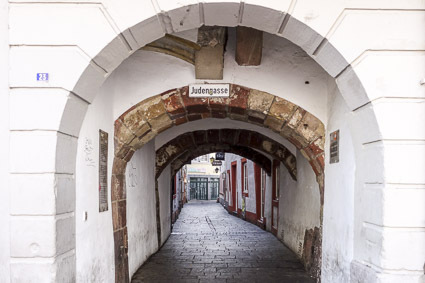 Six streets lead off the Hauptmarkt--among them, the Judengasse to the Jewish Quarter that existed until the Jews were expelled from Trier in 1418. 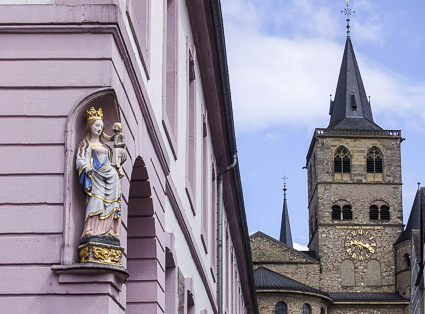 Our guide led us down another street, marked by a Madonna statue, to the Dom, or Cathedral, which (according to the tourist office) is the oldest bishop's church in Germany. 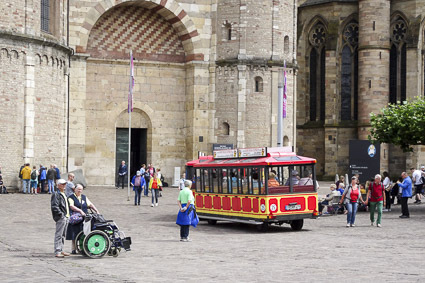 The Domplatz, or Cathedral Square, was a busy place with locals, visitors, and a rubber-tired tourist trolley. 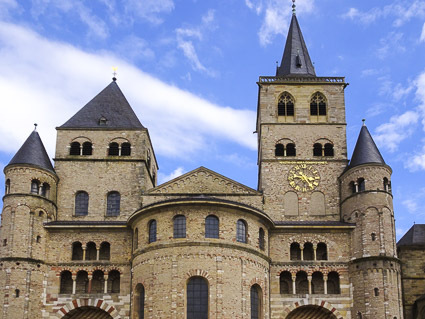 The Dom (shown here) was one of two churches on the square, the other being the adjoining Church of Our Lady. We visited both during our tour. 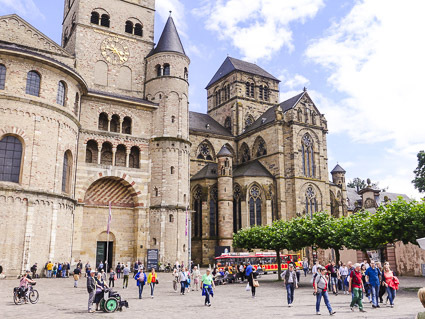 Most of the present-day Cathedral dates to the 11th and 12th Centuries, but parts of the building are from 326 A.D.
Our tour ended, and we returned to the Hauptmarkt to enjoy our limited free time in downtown Trier.